Premier Auto Carriers was started as a small company many years ago with one goal in mind, to provide a superior level of quality service in the enclosed automobile transportation industry. Over the past several years Premier has grown into a very well respected and reliable transporter. 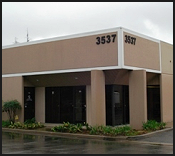 We now have 2 fully staffed offices, one on the west coast in California and one on the east coast in New Jersey, that enable us to maintain the superior level of quality service that our customers demand. We consistently strive to exceed our customer's expectations thru communication, late model state of the art transport equipment, competitive pricing, attention to detail, a dedicated management team, and most of all our commitment to quality. At Premier we believe "Quality Creates Its Own Demand". 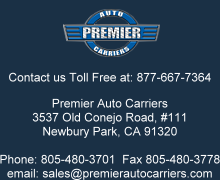 At Premier Auto Carriers we have experience in all areas of the automobile transportation industry. However, we focus on providing our customers with fully enclosed, fully insured and door to door service on one of our many company owned state of the art, fully enclosed, air ride trailers. These customers consist of major automobile manufactures, large dealership organizations, independent car dealers, auction houses, sports & entertainment professionals, Fortune 500 corporations, and collector / sports car enthusiasts and hobbyists. The confidence that these many satisfied customers have in us, has helped Premier grow into what it is today. Premier Auto Carriers maintains some of the highest limits of insurance coverage in the automobile transportation industry. We carry a $1 million cargo insurance policy and $2 million in liability coverage. We have an exemplary record with the US DOT and carry all appropriate authority, licenses and permits to operate as a motor carrier in the United States. However we do not operate in Canada or Mexico. We appreciate the opportunity to assist you with you automobile transportation needs. Please call or email and let us know how we may help.